How To Get 6X More Results From The Same Effort Without A Website – YOUR WEBSITE IS DEAD? Please hear me, If it’s not making you money, then it’s dead. Don’t worry, I know how it feels. I remember the good old days when websites were the greatest thing since sliced bread and you quickly went out to get one for your business. But… errrm, if I may ask since you got your website (especially in recent times when the competition has become crazy) how has it gone for you? I mean so far what’s the level of results you’ve gotten from it. Is it actually doing anything for you? Is it generating leads? Is it selling products? Let’s go back a bit in time. 13 years ago I had my first website built for me – for my start up. I was literally the envy of my friends and my colleagues then. It was the “in thing”. That was the era website owners sent people to their websites feeling cool about it. Truth is having a website then, differentiated you, made you look somewhat special. But come to think of it, when you decided to get a website, the single most important thing to you was to get more business, to generate more leads and more customers, wasn’t it? Most people forget this and go after beauty and aesthetics. I know you’ll say “o, I’m building a brand”. I totally understand that, but if you’re looking to use online marketing methods to promote your business, you have got to start seeing your website in a new way. First, lets quickly lay a foundation here: there are really only three ways to grow your business… any business! 1. Increase the number of customers – this is the part most people know about and understand. 2. Increase the size of their transaction when they come to purchase from you. 3. Increase the frequency of their transaction with you- get them to keep coming back to do business with you over and over again. So far, do you think your website has helped you to achieve these things? Or is it a confusing platform hindering your sales? See, the truth is, In the sales process, your website reduces the likelihood of getting people to buy from you. No matter how well-designed, your website is very possibly driving away a ton of your potential leads and sales. The first problem with sending people to your website is that its most likely just another corporate brochure telling people how great you are, and really no prospect cares about that! The biggest problem with a traditional website is that your visitors have too many choices to make and there’s no clear path to follow. Imagine yourself coming to a site and being pulled in every direction by a bunch of different links to different pages (and sub-pages in some cases). Research shows that people are six times more likely to take the required action when they have fewer choices. (See Sheena Iyengar’s TED Talk titled “How to Make Choosing Easier”). A confused mind always says no. That’s why you’re always thinking you need more traffic or that advertising doesn’t work, because after spending money on ads you don’t make any money! It’s not the fault of the ad platform, it’s your website that’s losing people in the sales conversion process. So how do we fix this and get the 6X more results? Glad you asked. >Websites aren’t designed to make money. >Websites fail because they don’t guide the customer to the sale. >The alternative to a failing website is a good converting FUNNEL. >Funnels are your website’s alternative and it will give you an upper hand that your competitors do not have. Let’s see a quick case study. A tale of two businesses – Divorce Attorneys. They both sent paid traffic to their online assets – Attorney A to his website and Attorney B to her funnel. Each got a total of 1000 visitors. When visitors landed on Attorney A’ s website, they had so many links and pages to click through to. He eventually got about 2% to convert to leads (20 people) and about 4% of the leads (4 people) became clients. When visitors landed on Attorney B’s site, a Funnel – there was only one thing for them to do. After they did that, on the next page she addressed some deep issues they had and gave them an option to sign up for a free consultation. The consultation was the necessary next step to convert them into paying customers. The results were clear… the Funnel beat the Website hands down! Let’s not forget the remaining leads, Attorney B could always go on to remarket/retarget them via email, Facebook/Google ads etc. 4- Once they’ve given you their contact details, move them into the next phase; buy a product, sign up for an appointment or consultation etc. 5- Once they’ve engaged in one way or the other, stalk them nicely. People can get busy and forget about you. Use retargeting to get them to come back and read your content, get your lead magnet, complete their purchase, etc. You’ll most definitely get better results with a funnel. With a funnel you will win every time capturing more leads, more conversions and more money, regardless of your business type – local business (e.g gym), expert (e.g speaker, coach), professional services (e.g lawyers, dentists)and other categories too. Just imagine the money you’re making right now and then multiply it by 6. 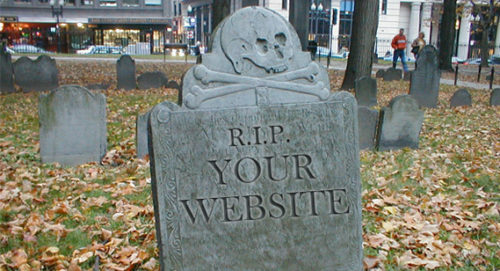 PS: The Era of Traditional Websites Is OVER! PPS: Your website serves a different purpose — purely informational, and your visitors should only be introduced to it after a first transaction ( email, sales, content view etc). PPPS: If you’re reading this and you can see that your website is not producing for you, and you’re still saying to yourself, “I know my website doesn’t sell much but I’,m not going to ditch it”. Just run a test – a funnel vs your website and see the results. What Is Your Wealth Creation Equation?